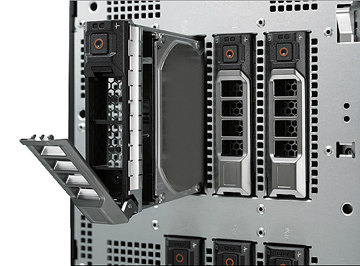 The Dell PowerEdge T410 tower server has two different hard drive chassis styles. Both the 2.5" and the 3.5" chassis form factors will take a maximum of six (6) hot-swappable hard drives. Alternatively, the 3.5" chassis also has an option to cable up to six (6) hard drives directly to the system board. SAS (Serial Attached SCSI) or SATA hard drives are available in either form factor. While SAS drives are usually faster, SATA drives tend to be more economical as they trade some performance for higher capacity. The PowerEdge T410 is designed to take advantage of newer 6Gbps hard drives, however, it is also backwards-compatible with the older 3Gbps standard. All hard drives below are shipped mounted in trays for the PowerEdge T410. Unless otherwise noted, they are refurbished, tested and carry our 90-day parts replacement warranty.